Maintaining a healthy, balanced diet has been extremely important to me for quite some time now. 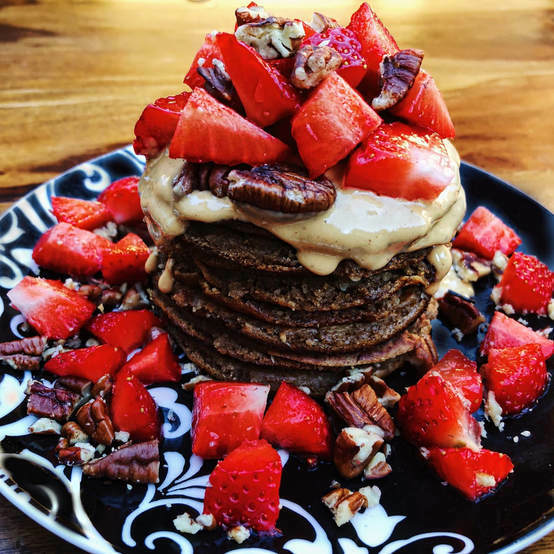 Although--don’t get me wrong--I do love the occasional treat (ask any of my friends, I have an obsession with bread pudding), I load my meals with tons of protein, whole grains, fruits, and vegetables. The time has come to get motivated and try to make positive changes to our daily menus, which is why I am helping you do so...starting straight from the top. For some reason, it has been rumored that skipping breakfast is “healthy.” Let me set the record straight...it is not healthy! Imagine riding in your car without any gas in your tank—you won’t get very far. It’s similar to eating: without any fuel in our bodies, we won’t be able to complete our daily tasks to our fullest abilities. I make sure to wake up every morning and have a big, protein-packed breakfast so that I can be energized and ready to tackle the busy day ahead. That’s why I collaborated with Vegan food expert Rume Ameke (@wellfitfoodie) to bring you 10 healthy breakfast recipes that are equal parts nutritional and delish-ional (totally a real word). Dig in! Add the ingredients into a pot and stir until the oatmeal is cooked. Top with strawberries, raspberries and pomegranate seeds. Oats are one of the healthiest grains on earth. They're a gluten-free whole grain and a great source of vitamins, minerals, fiber, and antioxidants. They contain soluble fiber, which helps to lower cholesterol and stabilize blood glucose levels. The hazelnut milk in this recipe is also beneficial, as it is naturally glucose, lactose, and soy-free. It contains the antioxidant vitamin E, which promotes healthy hair and skin and improves the health of heart muscles. Don’t let the word “chocolate” in this recipe stray you away from your healthy dreams. Cacao powder actually contains a ton of antioxidants that help stimulate the oxygen-based radicals in your body. So you’re good to go! Blend all ingredients together using a blender. 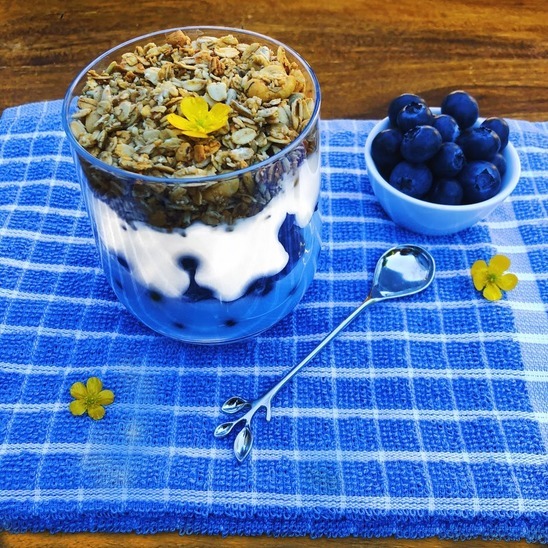 Top with blueberries and granola for an added crunch. Bananas are undeniably a fantastic source of potassium and magnesium and contain protein (like the protein powder), but benefits are multiplied by the addition of the other ingredients. Chia seeds are great sources of omega-3 fatty acids, fiber, antioxidants, iron, and calcium. According to a study published in the Journal of Strength and Conditioning, chia seeds also enhance exercise performance because they boost your energy. Additionally, spirulina is one of the most nutrient-dense foods on the planet and even helps fight oxidative stress and inflammation in the body. Lastly, the almond milk in this smoothie has no cholesterol or saturated fat and is lactose-free, as opposed to whole milk. It sounds to me like this recipe is just packed with health benefits! Mix the chia seeds, coconut milk, sweetener, and vanilla essence in a bowl and leave in the fridge overnight for two hours. In the morning, the chia seeds should be swollen and look like a pudding. Mix the coconut yogurt with matcha powder and spoon over the chia pudding. Top with blackberries, blueberries and sesame seeds. Besides being rich in fiber, omega-3 fats, protein, and minerals, chia seeds are high in antioxidants. This means that by eating chia seeds, you are preventing premature skin aging by reducing inflammation and free radical damage. Coconut milk—which is dairy-free, soy-free, and lactose-free—is another nutritional addition to this recipe. It can help lower cholesterol levels, improve blood pressure, and prevent heart attacks and strokes in the future. The matcha used in this meal has also been proven to reduce the risk of heart disease. It has many psychological benefits as well, including the calming of the mind, improvement in concentration, and the enhancing of one’s mood. Trust me, you’ll love this breakfast so matcha. Mix the butterfly pea powder with the yogurt in a bowl. Top with strawberries, blueberries, and blackberries, or any other fruit of your choice. Sprinkle quinoa puffs over the fruit for an added crunch. Like most yogurts, coconut yogurt is high in probiotics which help balance out bacteria inside of your body. Unsweetened coconut yogurt (like Koko’s) has no sugar and very little sodium, so it’s also healthy in that regard. Although butterfly pea powder may sound unfamiliar to you, I assure that there is no need to shy away from it. Butterfly Pea originated as a traditional Chinese and Ayurvedic medicine. It was used as a memory enhancer, brain booster, and calmative tool. Putting butterfly pea powder in your meal will also release powerful antioxidants such as flavonoids in your body, which will help reduce inflammation and strengthen your immune system. Top the recipe off with the high-protein, superfood quinoa, and you’re all set! Toast the bread lightly or to your satisfaction. Mash ¼ of the avocado and spread it on one slice of toast. Top with sliced cherry tomatoes and sunflower seeds. Slice the other quarter of the avocado and spread it on the other piece of toast. Top the second piece of toast with sliced radishes and linseed. Avocado toast has become a New York favorite...and for a good reason. Avocados are very nutritious, containing relatively large quantities of vitamin K, C, and B5. Additionally, an avocado contains loads of potassium, in fact, more than a banana! Avocado is a high-fat food, but don’t let that scare you off. The majority of the fat is oleic acid, which reduces inflammation and helps treat genes linked to cancer. Sourdough bread is a great base to smash your avocado on since it is high in protein and low in sugar. Not a fan of sourdough? Wholemeal bread is equally as nutritious, containing lots of whole grains that are an essential part of your diet. But there’s one aspect of this recipe that's certainly not grainy...the health benefits are crystal clear to me! Mix all the wet ingredients (including the peanut butter and chocolate chips) in another bowl. Fold the wet ingredient mixture into the dry ingredient mixture. Spoon into ramekins or muffin tins. Top with sliced bananas and more chocolate chips. Bake at 170°C for about 25 mins or until a toothpick comes out clean from the middle. Bananas are high in potassium, which balances your nerves and muscles, including your heart. They are also rich in riboflavin, which helps maintain your energy levels, increase blood flow, and protect your skin and hair. Oats contain more protein and healthy fats than most grains, making them an excellent addition to your breakfast menu. They also contain an important antioxidant called avenanthramide that helps lower blood pressure levels. Although flax meal is optional in this recipe, I highly recommend including it, as it is filled with omega-3 essential fatty acids that have positive effects on your heart. A recipe with this many nutritional benefits? That’s just bananas! Divide the yogurt into two halves. Mix one half with the blue spirulina powder and spoon into a jar. Add all the blueberries into the jar as the next layer. Add the remaining yogurt as next layer. Add granola to fill up the jar. Leave to rest for a few minutes and then fry one tablespoon at a time. Top with blueberries and blackberries. Mix all ingredients together in a bowl. Leave to rest for a few minutes and then fry one tablespoon at a time. Top with cubed strawberries and pecans. It’s undeniable that oat flour is highly nutritious—it is rich in antioxidants that improve heart health and reduce the risk of infections. But buckwheat flour offers even more benefits—it is very high in fiber and protein, making it a great alternative to white flour. Buckwheat flour also supplies two important vitamins: thiamin—which helps promote healthy circulation in the body—and niacin—which supports your nervous system. The almond milk also ups the nutritional factor in this meal; it contains 49% of your recommended daily intake of vitamin E, a vitamin that is essential in the formulation of red blood cells. Almond milk is also dairy-free, making it a great option for those who are lactose intolerant or trying to reduce their dairy intake. I’m nuts about this recipe! Blend the bananas with the coconut yogurt in a blender until smooth. Top with ground flax meal, flaked almonds, pomegranate seeds, strawberries, and blackberries. The high potassium and magnesium content in bananas help boost eye and bone health, as well as aid in relieving muscle cramps. By combining them with coconut yogurt, the body is being exposed to vitamin D—which is crucial for calcium absorption—and vitamin B-12—which is necessary for red blood cell production. The toppings also provide nutritional benefits: the ground flax meal has omega-3 essential fatty acids that improve heart health while the pomegranate seeds are rich in vitamin C, essential for repairing the tissues inside of your body. Feeling ready to take on your new, healthy lifestyle? I’ll give you the countdown. Ready...set...eat! 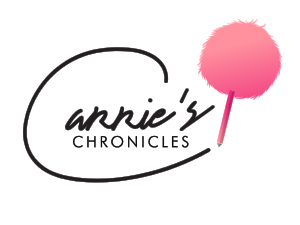 If you try out any of the recipes, make sure to post a picture on social media and tag @carrieberkk @wellfitfoodie #carrieschronicles for the chance to have your photo featured on our social media!